Earlier this week, ABC broke a story worked on by a group of Carnegie Fellows about child labor in blueberry fields in Michigan; in addition, the fellows investigated child labor in agriculture in New Jersey and North Carolina. According to the story, "A five-year-old girl, named Suli, was seen lugging two heavy buckets of blueberries picked by her parents and brothers, aged seven and eight. An 11-year-old boy in the Adkin fields told the Carnegie fellows he had been picking blueberries since the age of eight." In addition to violating child labor lays, these young children are exposed to harmful labor conditions, particularly given the wide-spread use of pesticides and chemicals. According to the ABC story, "The nurse with a migrant health clinic program, Josie Ellis, told the fellows she is concerned for the health of the young children given the widespread use of pesticides in the fields." Health consequences includes respiratory problems, rashes, and neurological problems. Like slavery, people may be aware that child labor is still a problem, but most do not think of it occurring in the United States. The ABC story quotes Zama Coursen-Neff of Human Rights Watch as saying: "Americans think of child labor as a problem elsewhere, but in fact we have that problem in our own backyard." 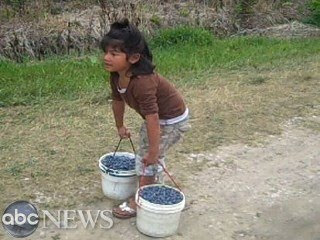 Human Rights Watch is also conducting an investigation into child labor in the U.S.
Major US companies, including Kroger and Wal-Mart, used to purchase blueberries from Adkins, the grower whose fields have been worked by children, according to the Carnegie Fellows investigation. "Walmart and the Kroger supermarket chain have severed ties with one of the country's major blueberry growers after an ABC News investigation found children, including one as young as five-years-old, working in its fields." In an interview with Democracy Now, Brian Ross, the chief investigative correspondent at ABC News, stated "we discovered a pervasive pattern, really across the country, of a situation that has continued for decades and has gone unenforced. There are laws against children this young working in agricultural fields. But for the most part, until very recently, those laws were largely ignored by federal authorities at the Department of Labor." This raises questions about the responsibility of both the US Government and corporations such as Wal-Mart, given that these violations of child labor laws are occurring systematically and have been for years. Though Hilda Solis, Secretary of Labor, released a statement in September stating that "Child labor and forced labor are inexcusable abuses of human rights," such abuses continue to occur in the U.S. The ABC story reports that "While advocates for children welcomed the enforcement efforts, many say the fines levied by the Department of Labor, are so slight they're little more than a slap on the wrist." Ending child labor will take a commitment to enforcing child labor laws, as well as a commitment to economic and social justice for low-income families and migrant workers, since these practices will continue as long as families cannot survive economically under current labor practices.